WACKER is a globally active company with over 3,500 products serving more than 3,500 customers in over 100 countries. Our portfolio includes highly-developed specialty chemicals. Found in countless everyday items and ranging from hairsprays to solar cells, these products are used, for example, as starting materials for non-naturally occurring actives. They also permit new production processes or make existing ones more environmentally sound and cost-effective. Moreover WACKER products are often additives that, even in trace amounts, impart novel or improved properties to well-known materials. Most of these products are based on inorganic starting materials. 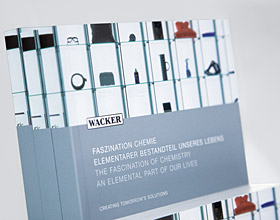 Silicon-based and ethylene-related products comprise 80% and 20%, respectively, of WACKER sales. Our customers include the consumer goods, food, pharmaceutical, textile, solar, electrical/electronic and basic chemical material sectors, as well as medical technology, biotechnology and mechanical engineering. As a producer of silicones and polymers, WACKER is particularly well represented in the automotive and construction sectors. Additionally, we are a key supplier of silicon wafers to the semiconductor industry. At WACKER, global is normal. 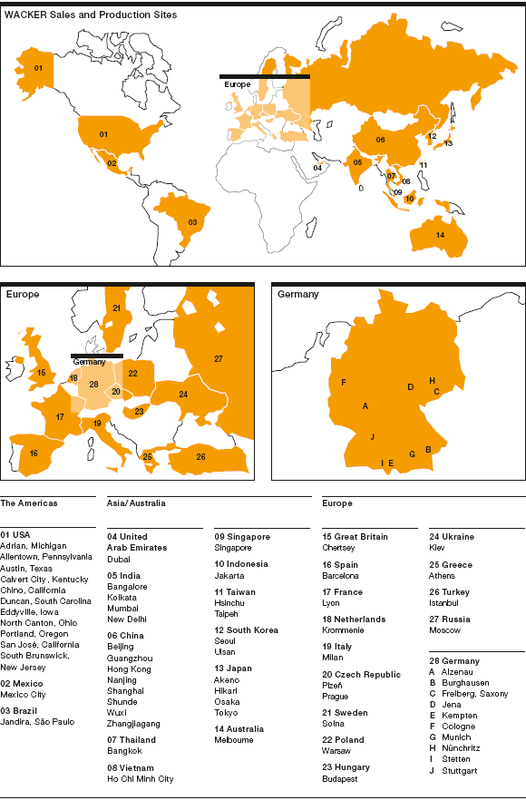 Many WACKER customers have a worldwide footing. We ensure customer proximity by operating on all five continents and consistently expanding our presence in growth regions. Our network of over 100 subsidiaries and sales offices is tailored to our customers’ needs and logistics. This dense network is enhanced by our 17 technical centers across the globe. In fiscal 2008, WACKER opened a further center in Moscow. Our production structure is just as globally oriented as our sales and service network. With a total of 27 production sites in Europe (9), the Americas (9) and Asia (9), we have a presence in all key regions. WACKER has five business divisions offering a broad range of innovative and highly-developed products and services. 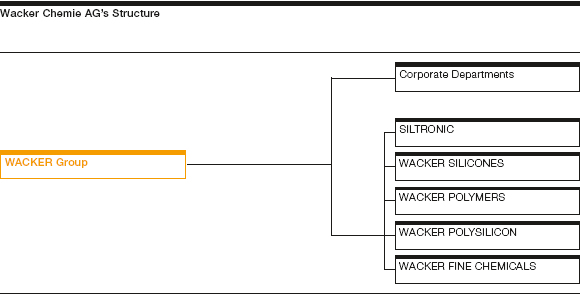 The WACKER Group has a matrix organization with clearly defined business responsibilities. The five divisions have global responsibility for their own products, production facilities, markets, customers and business results. Regional organizations are responsible for all business in their region or country. Aside from the divisions, the Group has corporate departments that primarily provide groupwide services, though some are also involved in production-related functions. WACKER products are found in countless everyday items. And, thanks to employees like Dr. Markus Busold, there are more products and applications every year. Dr. Busold taps into new technologies and tests our products’ applicability in other sectors.